You love your dream kitchen — beautifully outfitted with the professional Wolf range and built-in convection steam oven you’ve longed for. Now cooking is a joy, and your dinner guests rave about your brilliant culinary offerings. But as the party winds down and you bring out the coffee, you have a nagging feeling there’s a little something missing. Could it be your after-dinner coffee doesn’t quite live up to the rest of the lovely meal you served? Introducing the Wolf Coffee System, the cure for so-so coffee. 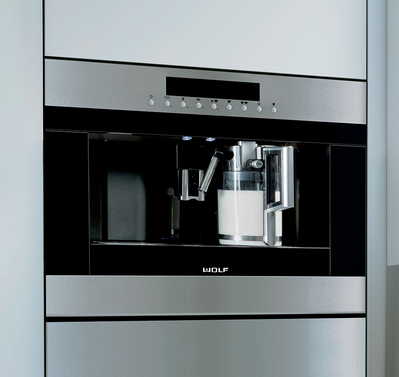 Wolf’s new coffee-making machines are designed to integrate beautifully and seamlessly with other Wolf products. Because they require no plumbing, they can be installed anywhere in the kitchen, freeing counter space but always within convenient reach. Whether you’re making a simple cup of black coffee for breakfast or whipping up a double no-foam latte to enjoy as you curl up with a good book, you’ll find the Wolf coffee system a joy to use and simple to maintain. Even the brewhead and milk frother cleanup with pushbutton ease are simple because milk never enters the internal workings. The 24” coffee systems coordinate with Wolf 30” ovens. They come in sleek black and sophisticated stainless, producing professional-quality drinks with the touch of a couple of buttons. Whatever brew or fancy drink you craft, you can easily customize every aspect of your drink, from temperature to strength to level of foam. The machine holds a generous supply of whole-bean coffee — about half a pound — and grinds it automatically to make your drink. It can brew single cups from pre-ground coffee, too, so you can have your breakfast blend even when the bean reservoir is full of espresso roast. Thirteen grind settings let you customize your whole-bean coffee for the taste and body you prefer. The Double Coffee feature lets you make two identical coffees using the dual spouts — or put a mug under both spouts to make a double-size coffee for one. And whether you want your brew ready when you wake up or when your dinner party is ready for coffee service, just program a time for the system to turn on and warm up automatically, and your unit will be ready to brew when you’re ready to enjoy. To complete your dream coffee system station, a 24″ cup warming drawer (with stainless or black glass door fronts) is also available — coffee always tastes better in a pre-warmed cup. And if your Wolf Coffee System and warming drawer should ever require service, remember Box Appliance is certified in all Wolf appliance repairs to protect your warranty on all Wolf products.